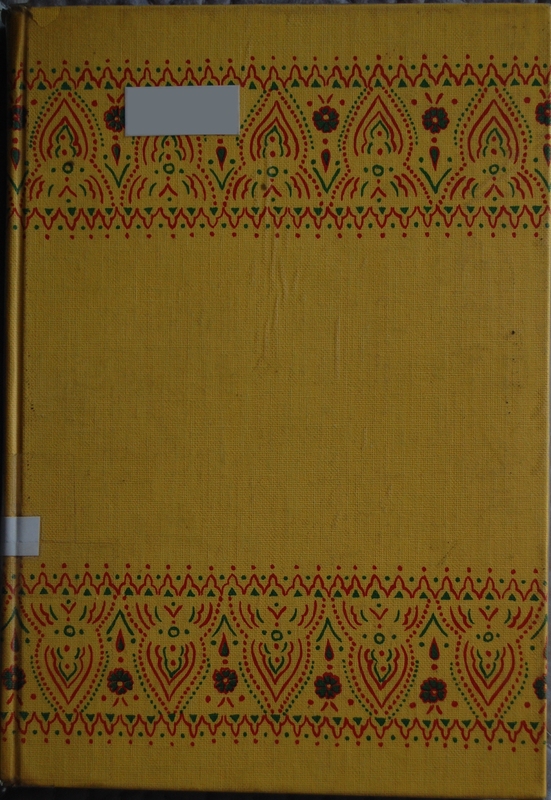 Front Binding – A pretty Indian pattern decorates the top and bottom of both boards and the spine on a bright yellow cloth. I could use some help on designer credit! 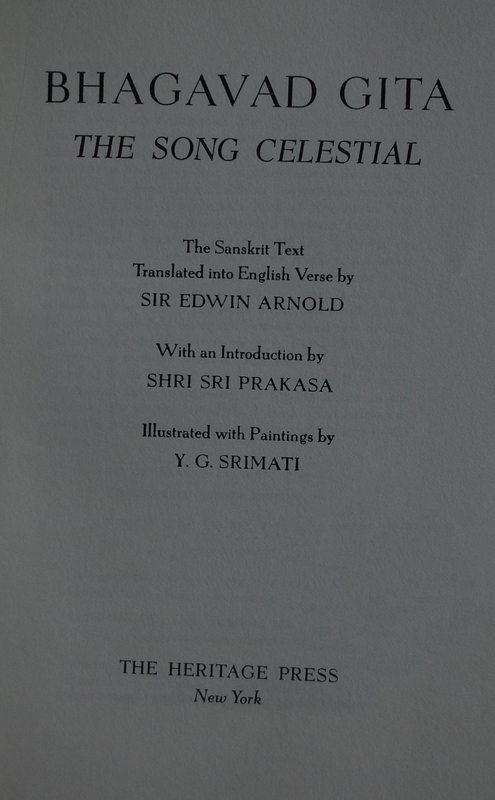 Title Page – Sir Edwin Arnold performed translation duties, converting the Sanskrit original into English verse. This edition reprints the Sanskrit text on the left, and the translation on the right. Shri Sri Prakasa provides an introduction. Y.G. 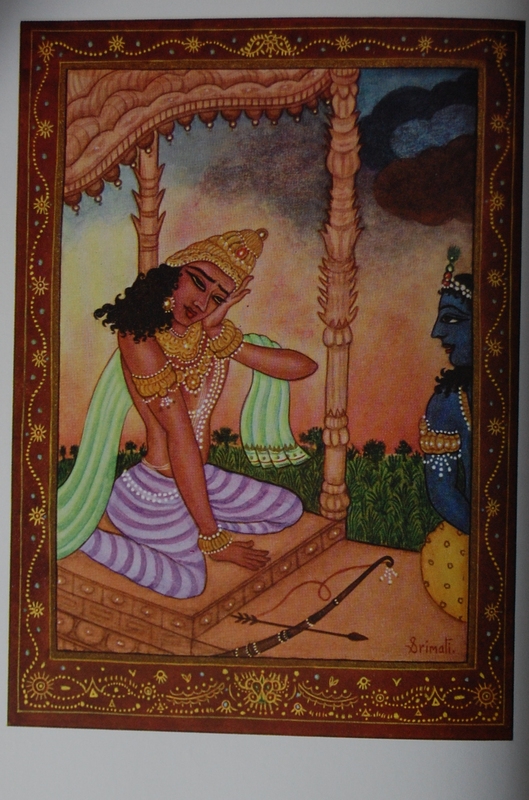 Srimati did 15 paintings for this book, which fit in quite nicely. She would also contribute to the LEC/Heritage Panchatantra that was issued in 1972. Page 5 – Srimati’s style is perfect for this important Hindu text, and she gave notes on each of her paintings in the back of the book. I’ll provide those for the three illustrations I’m highlighting. Confronted with the prospect of slaying his own kith and kin, his own preceptors and elders, and his own mates and companions, Arjuna is overcome by feelings of horror and revulsion. As he slips down to the floor of the chariot, and the bow and arrow fall from his trembling hands, he cries out to Krishna that it is impossible for him to wage this war against his own folk. The storm clouds gathering in the sky are symbolic of the storm raging in Arjuna’s breast. The cloud-hued Krishna looks on with kindly amusement. 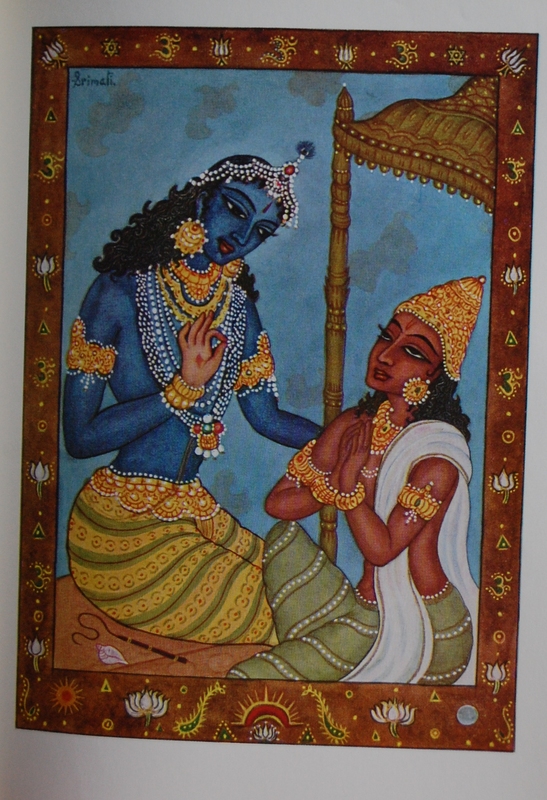 The Lord in His supreme wisdom and understanding comforts Arjuna by illuminating his disturbed mind with words of advice, enjoining the path of action in accordance with the duty expected of him – hence the transcendental expression on Krishna’s face and the complete surrender in Arjuna’s attitude. Intentionally the picture shows only the two protagonists of The Song Celestial, Nara (Arjuna) and Narayana (Vishnu, or Krishna), for in the sublimity of this concourse all else is of little account. In the border may be noted the ॐ (OM) symbolising the Lord in the form of a sound, the white lotus symbolising the idea of learning, purity, creativity, and blossoming, and the rising sun which suggests the awakening of wisdom and the understanding of reality in the mind of Arjuna. The yogi is one who with subdued mind practises concentration on the spirit. 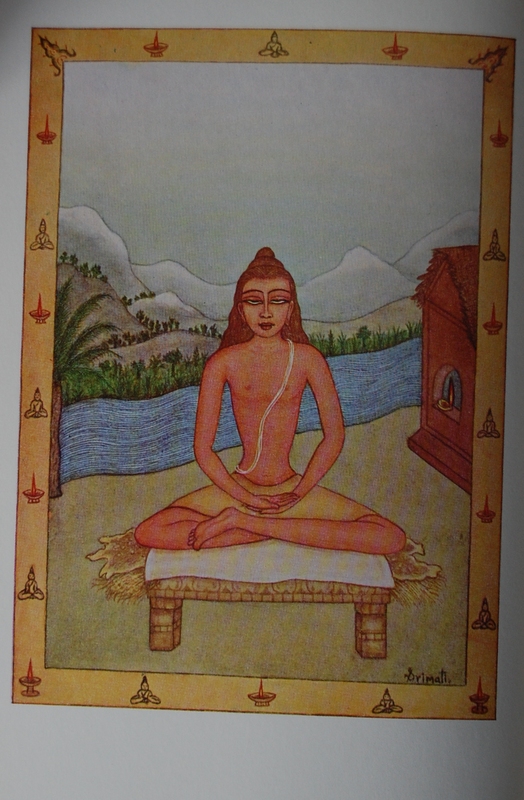 He selects a secret, clean, secluded place on the banks of a sacred river, firmly fixes his wooden seat, neither too high or too low, spreads over it sacred grass, then a deer skin, and then a cloth, and, assuming the yogi pose, restrains his thoughts and senses to bring his mind to a point. The metaphor of the yogi as a lamp in a place sheltered from the wind, so that it does not flicker, is depicted by the steady flame of the lamp in the niche of thje hermitage. The yogi and the lamp also provide the border motif. Personal Notes – I know very little about Hinduism and its classics, but I found this book to be an outstanding work. Perhaps I’ll read it, if I can ever find it beyond my library. Religious texts are among the hardest Heritage Press books for me to uncover. Any help or insights into the creation of this book would be lovely. Please let me know through the comments here or at my thread about this blog at the George Macy Devotees @ LibraryThing! Thanks! You are currently reading Heritage Press: The Bhagavad Gita – The Song Celestial (1965) at The George Macy Imagery.